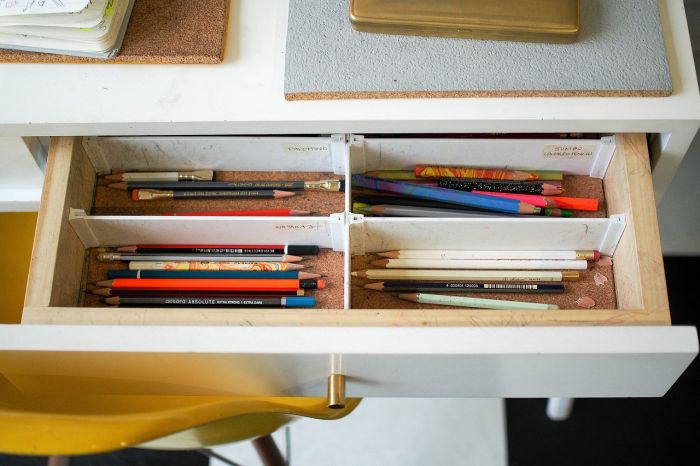 Are Your Gifts in a Drawer? We developed and taught a "Gifted to Serve" class for new members at our church in Southern California. Class members completed a variety of self-assessments, identifying their most-enjoyed skills, compelling interests, personality type, and spiritual gifts. We then helped people identify which of their abilities and interests they would like to use within work, the community, and in serving in our church. The final phase of the class was assisting them in finding or creating specific opportunities to use their God-given design to serve others in some capacity. We extended a personal invitation to each of the new members to participate in the class. One woman interrupted our brief description of the class with, "I've already done that." "Done what?" we asked, since we had barely started describing the class. "Took a spiritual gifts inventory....probably ten years ago," the woman replied. "Great! And what are your spiritual gifts?" we inquired. "I don't remember...they're in a drawer somewhere," she responded. "Anyway, I'm not interested in the class since I already took an inventory." With that, she turned and walked away. While we knew that her spiritual gifts were not literally in a drawer, they may as well have been! God has personally selected a variety of gifts for each of us, and He has given them to us to be used. Unless you know what your gifts are and are being intentional about using them, you are missing out on the fullness of what God has created you to do with your life. God has given each of us many gifts-skills, abilities, interests, spiritual gifts, personality traits and more. While spiritual gifts are an important component of your God-given design, there are many more additional facets to who God has created you to be. Anything you are able to do is ultimately a gift from God. How you are "wired" in terms of your inherent personality traits and the types of needs in the world to which you are drawn are part of God's handiwork. You have been created purposefully to do particular things in this world. Personalizing Paul's words, "...[You] are God's workmanship, created in Christ Jesus to do good works, which God prepared in advance for [you] to do" (Ephesians 2:10). Since God has called you to be His fellow worker in this world, He has a vested interest in helping you discover and use your gifts. 1. Lack of awareness that you have a design that matters. In his initial career counseling session, one 30-something man described how his parents had pushed him toward jobs with high incomes, and emphasized that his role in life was to get a secure job. What he enjoyed doing or was interested in was never really discussed. It was a new thought to him that he had a unique design-one that came directly from God-and had been given gifts with which to make particular contributions in this world. Our culture doesn't do a good job of teaching young people (1) that they have particular gifts; (2) how to identify them, and then, (3) how to connect those gifts with work and volunteer options. Most families, schools, and (sadly) churches don't help people learn how to discover and invest their God-given gifts. 2. Pursuing money. Whether earning a little or a lot, we have found that, bottom-line, many people have made the pursuit of money their primary goal in life. Jesus knew how big a temptation this was for us; sixteen of His 38 parables addressed how to handle money and possessions. Money becomes a "calling blocker" when it dulls our sensitivity to hearing God's voice and obliterates our ability to discern what He is calling us to do with our lives. "Accumulating money or stuff is a vision of sorts," acknowledges pastor and author Andy Stanley. "But it is the kind of vision that leaves men and women wondering...wondering what they could have done-should have done-with their brief stay on this little ball of dirt. Without God's vision, you may find yourself in the all too common position of looking back on a life that was given to accumulating green pieces of paper with pictures of dead presidents on them." Seeking to use your gifts in this world often doesn't require a reduction in income or a major change in your lifestyle. In fact, as your work aligns with your design, you may find that you will earn more money than you ever have previously. The key issue, however, is that God wants you to come to the place where you are willing to live on less money if doing what He wants you to do requires it. He wants you to value obedience to Him more than money and material possessions. As Billy Graham said, "There is nothing wrong with men possessing riches. The wrong comes when riches possess men." 3. Fear. Remember the third servant in the Parable of the Talents? He dug a hole and buried his one talent. Why? Because he was afraid. Most of us can identify at some level with him. Fearful of trying to invest our talents and failing, we may choose to ignore them-or even run away from them. But as Jesus told us in this story, hiding our talents displeases the Master. Our talents have been given to us to invest in the world. We often find, however, that we get stopped in our tracks by the powerful calling blocker of fear. Fear can range from mild anxiety to an icy, gripping incapacitating paralysis. God knows we are fearful creatures; the command in Scripture that occurs more often than any other is: "Fear not." So why does God command us not to fear? Here's John Ortberg's response: "I think God says "fear not" so often because fear is the number one reason human beings are tempted to avoid doing what God asks them to do." Our reaction to past failures, unrealized dreams, regrets, and our fear of future failures can get us stuck. While fear is an understandable human emotion, it is not an acceptable excuse for burying our talents and avoiding doing what we sense God is calling us to do with our lives. Fear and failure need to be reframed; they are tools God can use to shape you into the person you need to become so that you can do what He has created you to accomplish with your life. 4. Lack of a practical plan to turn your dream into reality. Many times we have talked to people who are frustrated because they have an idea of what they want to do, but they don't know how to make it happen. There can be a number of reasons for this. Sometimes people think they have a goal (such as "I want to do something creative" or "I want to help people") without realizing their idea needs much more definition before they can pursue it. There are myriad ways to be creative or to help people in this world. They need to determine specifically the "who-what-why-where-hows" of what they want to do. Other people think-although they may not fully realize it--that they have a deep-down expectation that if God wants something to change in their lives, He will supernaturally bring it to pass without their having to do much at all. While God can work this way, He typically chooses to work throughus as we take the needed actions. When we risk prayerfully moving forward in spite of fears and difficulties, God has the opportunity to transform us into more mature disciples who are capable of doing much more for the Kingdom. Most often, however, we find that people just need to work more on developing a step-by-step plan for making a transition. They may need more input from others to know what steps are needed; some creative brainstorming to overcome perceived obstacles; and additional support and encouragement to keep going in the face of the unknown. Don't try to go it alone; enlisting help from others can make all the difference! How about you? Have you been so busy working your whole life that you've never really taken time to think about what God has put you on this planet to do? Or, have you tried to figure it out but feel like you're stuck in discerning who God has created you to be and/or what He's designed you to do? Maybe God has gotten your attention through your life circumstances, and you know that NOW is the time He has ordained to take a new look at your gifts and what He's calling you to do in the next season of your life. God is on your side! He wants you to know, in an in-depth way, the gifts He has given you. He wants to partner with you in helping you invest your gifts in life-changing ways. 1 Peter 4:10 says, "Each one should use whatever gift he has received to serve others, faithfully administering God's grace in its various forms." By using your gifts, you can be an instrument of God's grace in your church, family, community and work. Not only will you change other's lives, but your own life as well. Make a plan for moving forward in identifying and using your gifts. If you would like some professional assistance, we would consider it a privilege to help you discover and live your calling! We invite you to schedule a free career services consultation session. to discuss your unique situation and how career counseling/coaching can help you forever get your gifts out of the drawer and into the world!